I’ve been asked by a few people for some simple snack ideas lately. Rather than get all crazy here, I’m gonna go with an old classic this week. Pour 1 tsp sesame oil & 2 tsp olive oil in. Toss w/ 1 lb. of raw almonds until all are coated in oil. Cook 5 minutes, tossing the almonds for even heating. Add 1 Tbsp Soy sauce & 1 Tbsp Worcestershire sauce. Toss & cook 1 min. Add in any seasonings you like. Just keep the salt level low. On my last batch, I used: Red Pepper flakes, Chili Powder, Sea Salt, Nature’s Seasoning, Old Bay, Cumin, & Garlic Powder. Toss to coat. 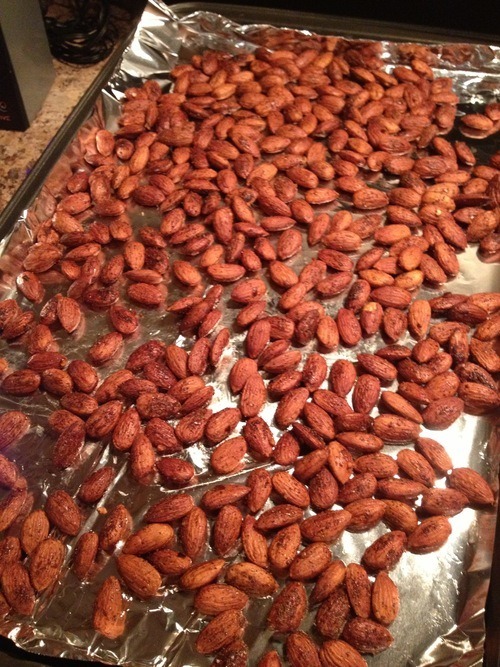 Lay Almonds in a single layer on a baking sheet coated with Foil or Parchment Paper. Roast for 20 min. Allow to cool for 30 min…… if you can. Side note: if the seasoning doesn’t stick to your almonds, you messed up somewhere. These should be just as good as any store bought seasoned almonds. Except, ya know without any preservatives or stabilizers. Oh, and the seasoning is exactly whatever you want it to be. Get creative with your seasonings! If you come up with a good one, let me know about it. I always love trying new combinations.